Yep, those are some hokey special effects. The trailer also makes the film seem campy, which it isn’t in the least. Those details aside, note how the narrator states that “A nineteenth century gentleman and a twentieth century woman join forces to capture a criminal from the past.” That’s exactly the kind of fused hero dynamic I love to see in a science fiction romance! 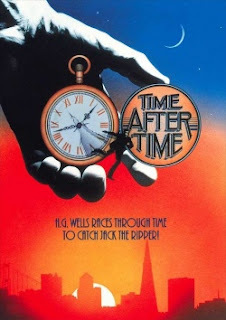 Now, this film is probably more accurately described as romantic SF thriller/steampunk since Wells and love interest Amy Robbins don’t meet until about a third of the way into the story. But when they do, there’s a wonderfully smooth meshing of the SF and romance components. The romance becomes integral to the story, and there’s an HEA. The story was fun and engaging. The cast especially was great. Malcolm McDowell was such a hottie as H.G. Wells. I don’t normally go for the boyish look, but McDowell’s performance sucked me in. No wonder Mary Steenburgen hooked up with McDowell during the making of this film! And David Warner? A more sophisticated film version of Jack the Ripper never stalked the streets of San Francisco. At first, when H.G. Wells arrives at the present and Amy practically throws herself at him, it felt like a straight-up heterosexual male fantasy. But once the film got over that hump, Amy became a strong character in her own right. Without her, Wells wouldn’t have been able to do much more than tie his shoes in “futuristic” (to him) San Francisco. He knows it, too, admires her for her courage, and isn’t emasculated in any way because of it. The two become more than the sum of their parts. I kinda wish Amy didn’t have to give up what she did at the story’s end, but her choice did fit the plot (especially if you know the history of H.G. Wells’s personal life). Isn't that an awesome line? Have you seen this film? If so, what did you think about it?